Last year the biodiesel industry lost a pioneer who has had a huge impact. 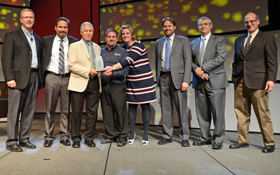 He was honored with this year’s Eye on Biodiesel – Pioneer Award. On stage at the National Biodiesel Conference & Expo to honor him were several people for whom he had a very personal impact and accepting the award was his brother Scott Hanks. The biodiesel industry lost a true pioneer with the passing of Utah State University’s Dr. Dallas Hanks last June when he succumbed to cancer. For those that knew him, Dallas was a brilliant scientist, educator, humanitarian, entrepreneur, and all around good person. He spearheaded the visionary feedstock program Freeways to Fuels, was a huge supporter and contributor to NBB’s Next Generation Scientists for Biodiesel program, and had a hand in numerous oilseed test plots, biodiesel laboratories, and technology start-up business at the university and around the region. The respect he had from his peers was second to none, and he has left a truly lasting legacy in the biodiesel world.